Dollar bill origami is an interesting variation on the more commonly seen origami paper or standard typing paper. It's useful as a conversation piece at a bar or restaurant. You can also leave your tips in the form of origami! This is a sure way to get waitpersons to remember you, and will probably make their day a bit more interesting. For those not in the USA, the dimensions are height = 66mm (2.6 inch) and width = 156mm (6.1 inch). 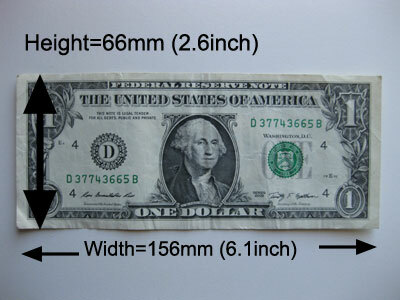 So even if you do not have access to a USA one dollar bill, you can still fold these origami by using a piece of paper with those dimensions. Or you can divide a square origami paper to the dollar bill proportions. We've created a separate page of instructions to show you this technique.